The AIM-9X is the latest weapon system added to the Hughes missile portfolio. In December 1996, the Naval Air Systems Command awarded Hughes Missile Systems Company a $169 million winner-take-all contract for engineering and manufacturing development of the AIM-9X, the next generation for the existing AIM-9M Sidewinder short-range air-to-air missile. NAVAIR selected the Hughes Evolved Sidewinder offering, derived from an AIM-9X demonstration/validation contract the company received in 1994. AIM-9X is a joint Navy and Air Force program with the Navy serving as the executive service. The program is worth an estimated $5 billion in potential sales over the next 20 years. U.S. production would include up to 10,000 missiles, and a significant p otential exists for international sales to allied nations. Evolved Sidewinder is an improved version of the Sidewinder that incorporates thrust vector control. It is configured with Hughes' mature, high performance production focal plane array sensor, a Texas Instruments advanced tracker and the existing AIM-9M rocket motor, warhead and fuze. 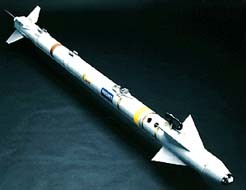 The sensor is highly common with the U.K. ASRAAM sensor. Texas Instruments, Matra BAe Dynamics (UK), HR Textron and Alliant Techsystems are key teammates in the Hughes AIM-9X Evolved Sidewinder program.